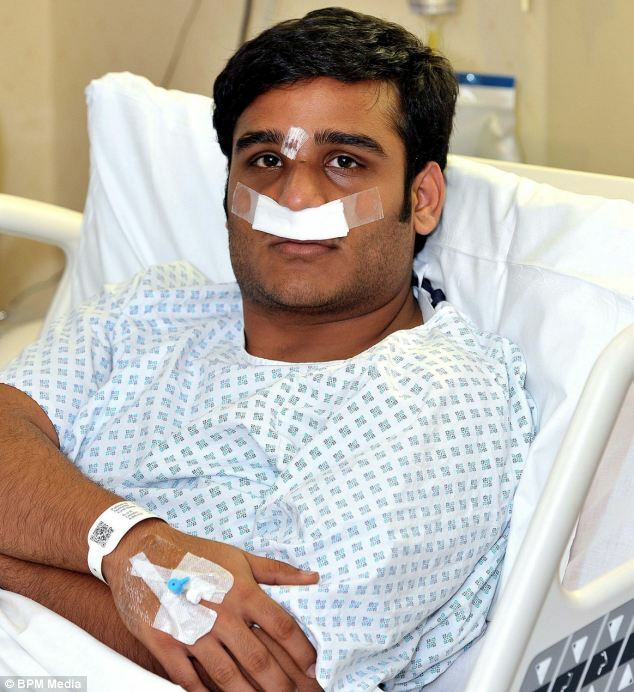 A student shot in the face in Pakistan has had the bullet removed through his nose in pioneering surgery carried out by a Birmingham medic. Ummad Farooq, 22, underwent the one-hour operation at the Queen Elizabeth Hospital in Edgbaston – potentially saving his sight. 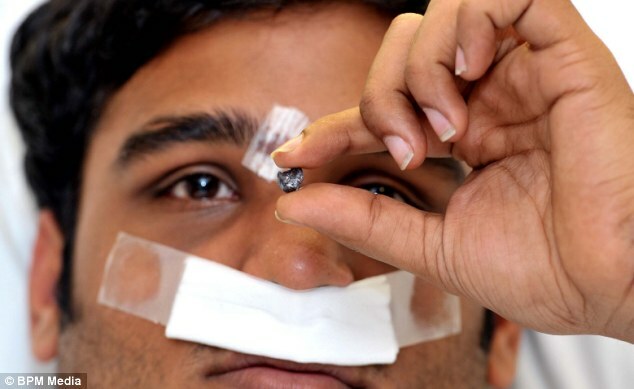 Leading ear nose and throat consultant Shahzada Ahmed removed the bullet using a Cyclops, a new instrument that enables the surgeon to see better and carry out operations quicker. Mr Farooq, who had been studying finance at Sunderland University, is now recovering at the privately-run BMI Edgbaston Hospital after supporters back home paid for his treatment. He said: ‘I’m very grateful for what Mr Ahmed has done. Doctors in my country said surgery was too risky. His nightmare began after he flew out from the UK to Karachi for his brother Saad’s wedding. What should have been a joyous family occasion soon turned to tragedy when the brothers, their father and two other relatives were ambushed on October 19. Saad, 26, was shot dead at the scene while Ummad’s father was pumped with six bullets – but survived. The finance student explained: ‘My father is the president of the Ahmadiyya Muslim community in Karachi and the hierarchy of this group has been a target as it is not a recognised religion in Pakistan. ‘As a result we were targeted. My brother died at the scene and I was hit in the eye. I couldn’t see and didn’t realise that my father had also been shot six times. Ummad was flown to Birmingham on October 27 and underwent the operation on Sunday. It is the same hospital where Pakistani schoolgirl Malala Yousufzai, 15, is also being treated after being shot in the head by the Taliban. Consultant Mr Ahmed said: ‘I have never used the Cyclops in this way and it is quite unique to remove a bullet through a patient’s nose. Thank God for giving these surgeons the skills and expertise to carry out such operations. God bless them all!